Promotional wristbands are a great way to identify with a marketing cause or to be used as an entry tag into a nightclub or party. We can supply our wristbands printed with your logo or de-embossed where the logo imprint is sunk into the wristband material. Let us know your preferred option and we can quote you. Looking for a durable, low-cost giveaway that is guaranteed to stand the test of time then look no further than silicone wristbands. Silicone bracelets are an innovative and appealing way to create a mass marketing effect. Silicone wristbands are versatile, and come in a variety of fun colours. They’re popular and people want to wear them as a fundraising and awareness tool. Custom bracelets of many different varieties are still very popular. 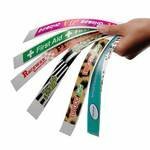 By designing wristbands with your product name and company logo, you’ll easily reach wide audiences. The flexibility of the bracelets helps you to print or try some popular styles such as embossed or debossed. Wristbands also serve a great practical purpose at events or festivals. They can be used an innovative new way to ticket events that will also give them something to keep as a memoir of the big day with your brand visibly stamped. With festivals becoming increasingly popular each year, don’t miss out on this great sponsoring opportunity to get your brand out to a wide audience. Silicone wristbands have had broad media exposure in the past when celebrities have been caught wearing them as fashion statements, which truly proves how a popular item can be seen far and wide when you get the product right. Two of the most popular uses for wristbands is for charities as part of their money collection and events to control access. Wristbands are highly durable, waterproof and comfortable to wear and especially so when made from silicone. Rubber wristbands have very similar properties but as with any material close to the skin, care should be taken to make sure there is no allergic reaction. What wristbands offer so well is a great imprint area. Whether you want one or two colours or even more in the form of a full digital imprint, you don’t have to worry when you come to Redbows. You’re in safe hands and a supplier who has supplied thousands of such products to many different marketing events and organisations. Please let us know if you need a sample branded wristband from a previous marketing campaign. Alternatively you can send us your logo file and then our in-house design studio can generate a virtual visual to show you how your logo could look on any of these products. If you don’t have a vectorised file for your imprint, don’t worry as our design team can also generate this for you. When you are ready to order simply confirm acceptance of our on-line quotation or place your order through our website checkout process. We will then process your order and artwork file and send you an artwork acceptance form. Please note that all delivery times are from the date you sign off the artwork acceptance form. This is because we often find it can take a few days to get the artwork accepted. 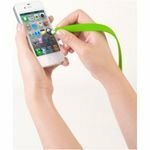 Do you offer any gadget wristbands? 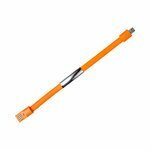 We have some wristband products that include a gadget such as a stylus. This can push up the unit cost price and mean that the wristband has to be easily removed. Can wristbands be easily removed? Some of the wristbands we supply can be easily removed. Those with a button or clip will lock and so the only way to remove the wristband will be to cut it off. This type of wristband is very popular within the festival and hotel markets where they are given out and must be worn for the duration of the festival or hotel stay. 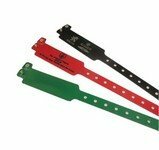 Different coloured wristbands can also be used to provide access to different areas or levels of service. Can you print both sides of a wristband? Some wristbands may offer an underside print option. Please check the specifications section of the individual product you are interested in to see if there is an underside print option.